Home / News / Something Super Is Happening At Muffin Break! Something Super Is Happening At Muffin Break! To celebrate the launch of Ooshies in our Mighty Mini Meals, some of your favourite superheroes have been spotted in a few of our Western Australian stores! 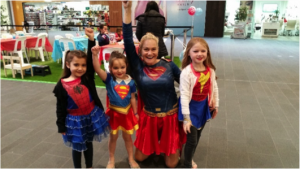 We had our Mirrabooka store getting into the Ooshies spirit when staff came to work dressed as their favourite superheroes to celebrate the new addition to our kids’ meals offering. 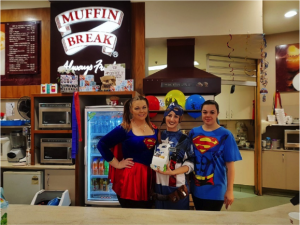 Our Lakelands store also held a muffin workshop where we had staff and kids dressing up as their favourite heroes during on of our muffin decorating workshops. Our workshops are a great way of spurring creativity and sparking an interest in cooking. All the better if you get to dress up while participating! We have three types of workshops, all of which are super fun for parents and kids. 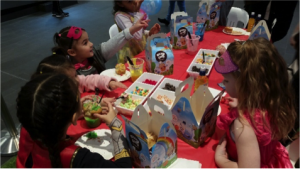 Depending on the workshop, you can either roll out a ball of cookie dough to be decorated then cooked by our expert bakers, or we provide you with an already baked cookie or muffin to ice and decorate. Keep an eye out at your local Muffin Break for any upcoming cookie workshops, and be sure to pick up a Mighty Mini Meal and your free Ooshies collectible toy today!